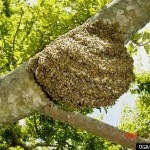 Homeowners should be extremely cautious when in the vicinity of a suspected stinging insect nest. It is not advised to attempt to eliminate or remove any nest without proper knowledge and equipment. Trained beekeepers and pest professionals have the tools to safely remove stinging insects that pose a danger to a family or the general public. Many stinging insects have similar coloring and patterns, but it is possible to tell different species apart by their body shape and the type of nests they build. If homeowners suspect that a colony of insects has built a nest in or near their homes, a general identification of honey bees versus yellowjackets can help pest professionals determine the next steps to take in pest removal. 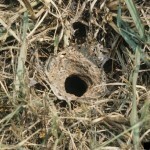 Bumble bees usually nest in dark cavities or in the ground. 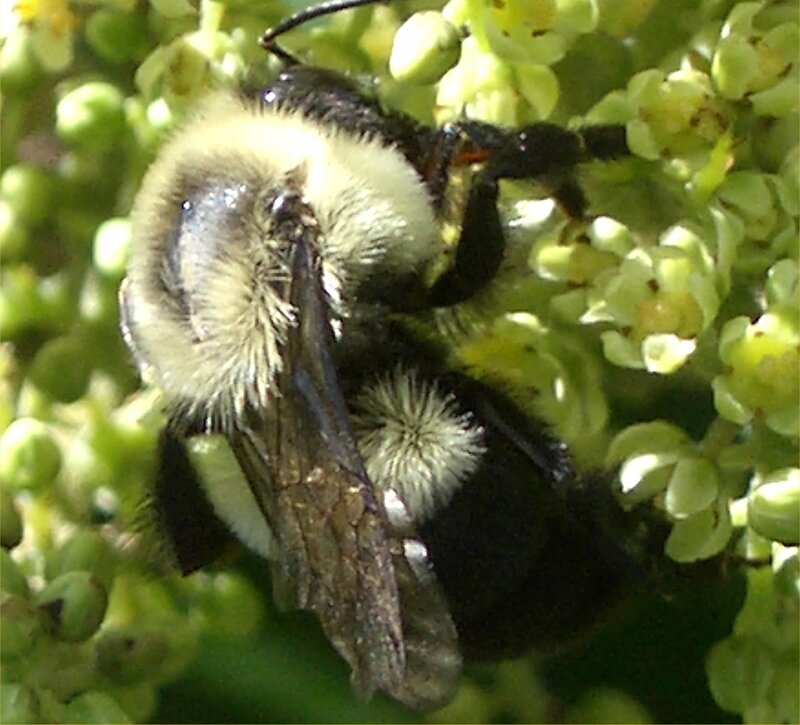 They are a traditional “bee shape,” have light yellow and black coloring and are often described as fuzzy. 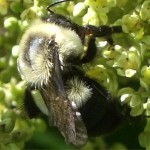 Bumble bee nests are made of wax. 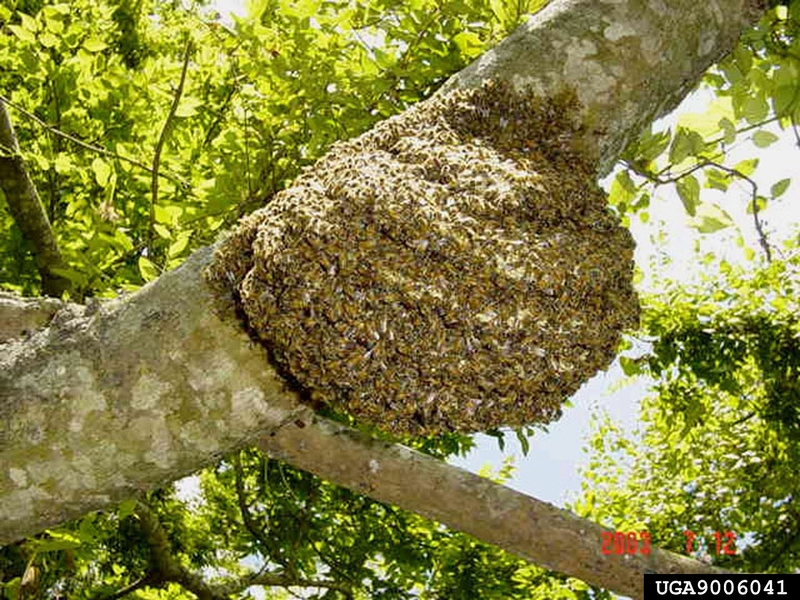 Honey bee hive. Photo courtesy of Timothy Haley, USDA Forest Service, Bugwood.org. Honey bees are a yellow-orange color. During the spring, honey bee colonies may swarm. Swarming is the process of honey bee colony reproduction and involves the splitting of a colony where 30-50% of the bees leave the hive with the old queen. The swarm flies to a temporary site for a day or two before a new permanent nest site is chosen. These swarms often alarm people, but bees in this state are very docile because they don’t yet have a nest to defend. Honey bees prefer to build a nest in a sheltered location such as a hollow tree, wall, or attic and seek out such locations. Swarms are valuable to beekeepers and most local beekeeping clubs or police keep list of beekeepers willing to collect swarms. 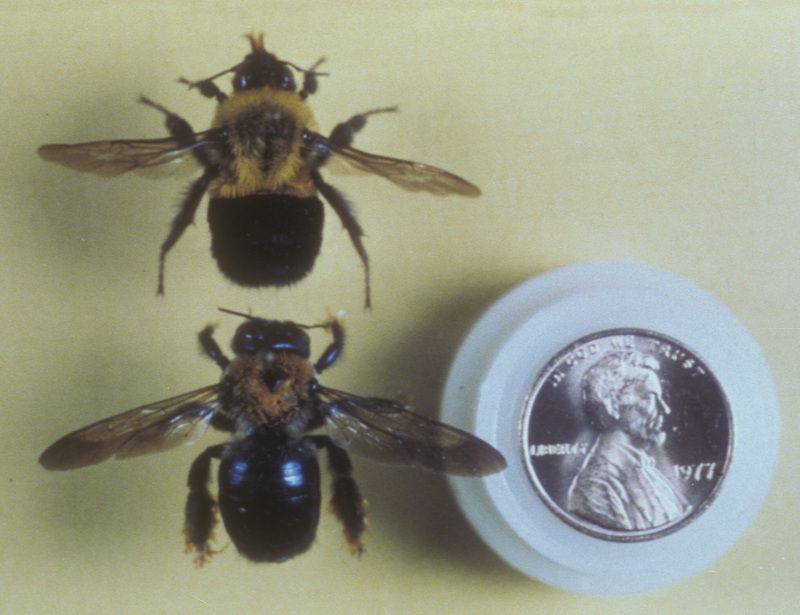 Carpenter bee (bottom) compared to a bumble bee. 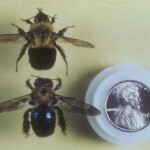 Carpenter bees are almost twice the size of other bee species and are much more round in shape. They are mostly black with yellow, and make their nests by boring holes into wood. Each female bee constructs her own nest. 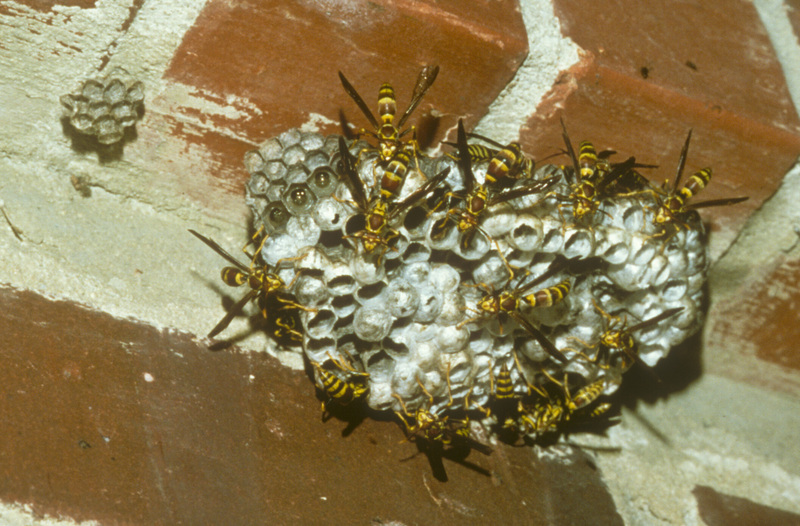 Wasps are mostly identifiable by their nests. They use materials such as mud, clay or a paper-like substance. These can be built in trees, shrubs, porch ceilings, rafters, eaves, or doors. Wasps can also be a combination of colors including black, yellow and red, and they have more of an hourglass shape than bees. Hornets can have varied coloring that make them easy to confuse with bees. 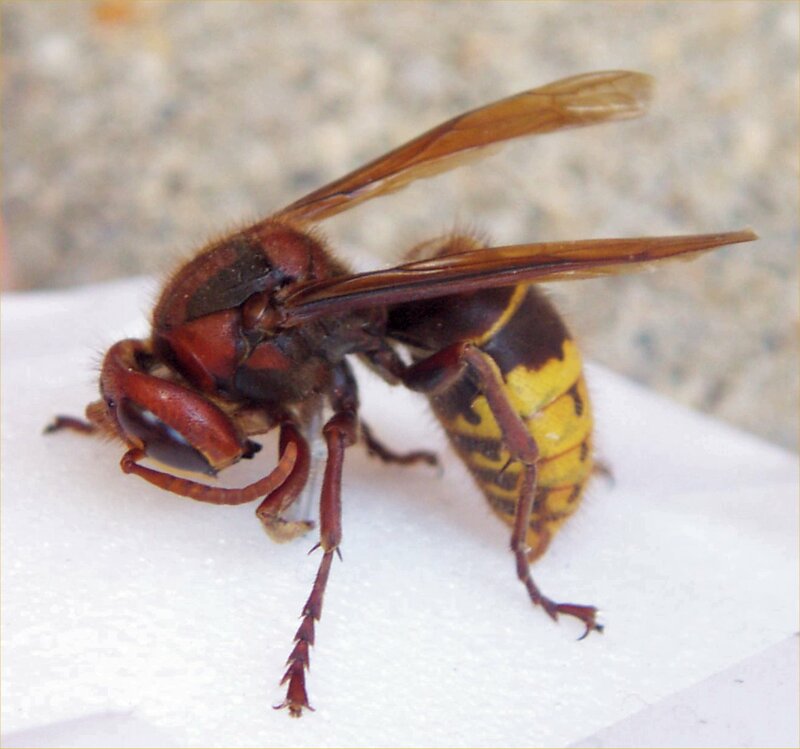 The most common type is the European hornet. 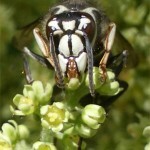 This stinging insect is mostly brown with yellow stripes on its abdomen. They are primarily a forest-dwelling insect but are drawn to lights and can alarm homeowners by banging on windows at night. 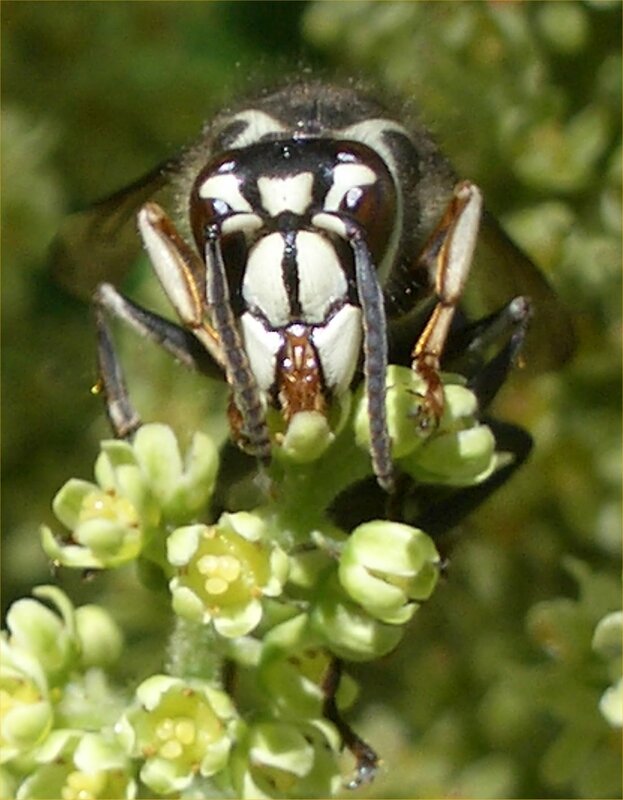 Yellowjackets have stark yellow and black bands across their abdomen. They may nest in the ground around plant roots or logs, in structures, in bushes, or in trees, depending on the species. 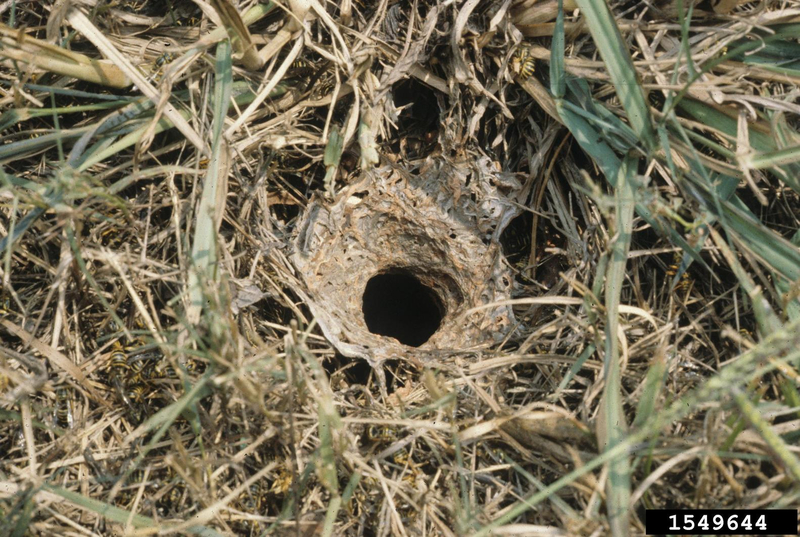 The nests are made of paper and can be the size of a basketball. Although called hornets, Bald-faced hornets are actually a variety of yellowjacket. They are black and white and get their name from their white face.